Paul Vidal de la Blache (1845-1918) commands an especially important position in the history of modern geography, as the acknowledged ‘founding father’ of the French School of Human Geography. This is how Howard (1986:174) introduces the man whose name is displayed on the road sign, illustrated on the right. 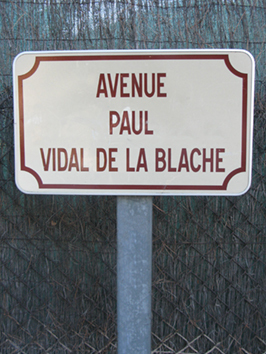 Vidal de la Blache was born in Pézenas and one of the town’s main thoroughfares is named after the geographer (see earlier post on place-naming). Vidal de la Blache’s Tableau de la Geographie de la France is perhaps his best known book, and his ideas on regional geography strongly shaped geographical paradigms at that time (see Baker 2002). However, we need to look further back than the Vidalian era to better understand the development of geography, both in France and more generally. Heffernan’s article in TIBG provides this “deeper history” by exploring the scientific value of geography during the early 18th century “before the first geographical societies were established in Paris, Berlin and London” (p.1). He draws on archives and publications of the Paris Academy of Sciences to explain how geography became recognised as a science, particularly with the election of a specialist in geography in 1730 – Philippe Buache. Heffernan’s broader argument proposes this organisation as one of the key sites in which geography became defined, practised and produced in Europe (linking to the creation of scientific knowledge and epistemic formation). So how was geography defined at this time? Geography emerged, as scientific practices such as cartographic survey were re-allocated from astronomy. This, Heffernan suggests, laid “the conceptual terrain on which the modern discipline would later be enacted” (p.9). The influence of Buache’s work in the mid 18th century (notably his 1752 memoire) is also said to have laid the path for political debates about the role of ‘natural’ regions to French administrative geography. These geographical ideas are perhaps linked to those that came later in the work of Vidal de la Blache. 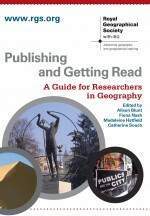 Overall, Heffernan’s paper provides a deeper insight to the historical creation of geography as a recognised discipline. This entry was posted in Early View, Transactions of the Institute of British Geographers and tagged Cultural Geography, epistemic formation, history of geography, Paul Vidal de la Blache, Pezenas, Philippe Buache, scientific knowledge on November 12, 2013 by fionaferbrache. This entry was posted in Content Alert, Early View, The Geographical Journal, Transactions of the Institute of British Geographers and tagged alienation, Australia, Clare Madge, cultural landscapes, ecosystem services, Indigenous, James R A Butler, Leanne Claire Cullen-Unsworth, Marilyn Wallace, measurement, Morgan Robertson, Original Articles, Parvati Raghuram, Pat Noxolo, postcolonial interventions, principles and determinants of success, Rosemary Hill, scientific knowledge, Wet Tropics World Heritage Area on November 4, 2011 by anonuser.